An artbook? Yes, the covers (in and out) are color and the rest is black & white. The book is 25 pages and begins with an original comic depicting Shinji’s first interaction with the Garland leading up to its theft. 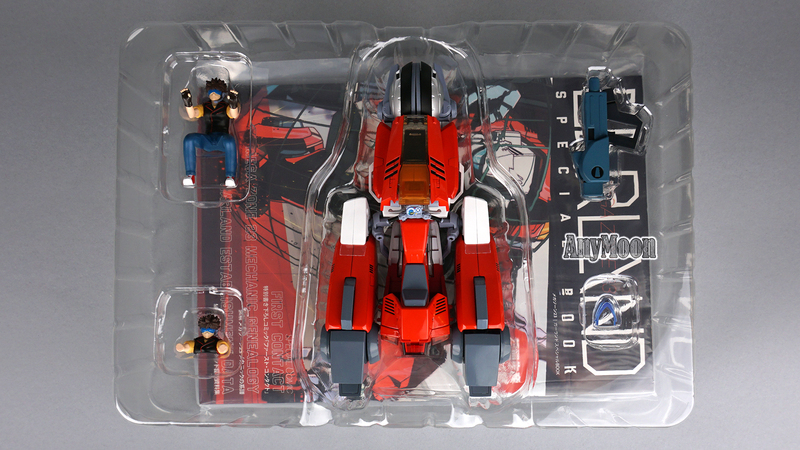 It doesn’t compete with the artbook Yamato included with their Megazone Celebration 1/15 Garland +DVD+Artbook set but it’s still a very nice extra. What more could you have asked for? 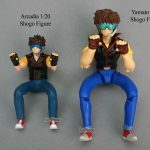 The original Yamato toy came with different faces for the Shogo figure, here entire heads would probably be necessary but doable. 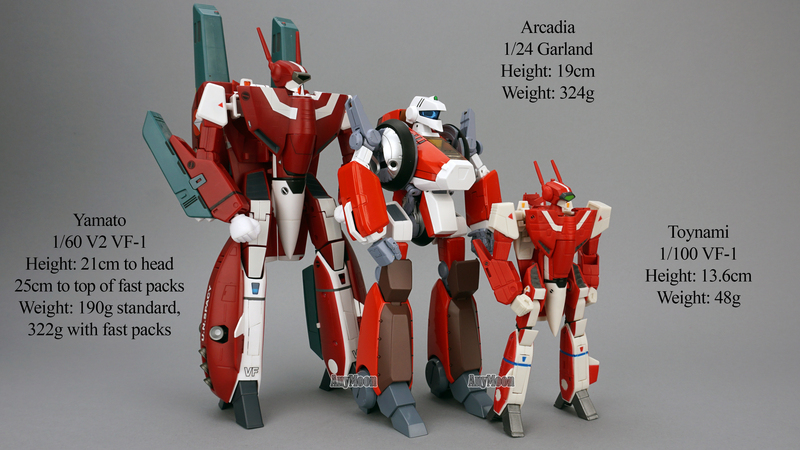 A Yui figure would obviously be a huge plus but maybe Arcadia will follow Yamato’s lead and do that for a military paint version of the Garland. Shogo is small so concessions have been made. 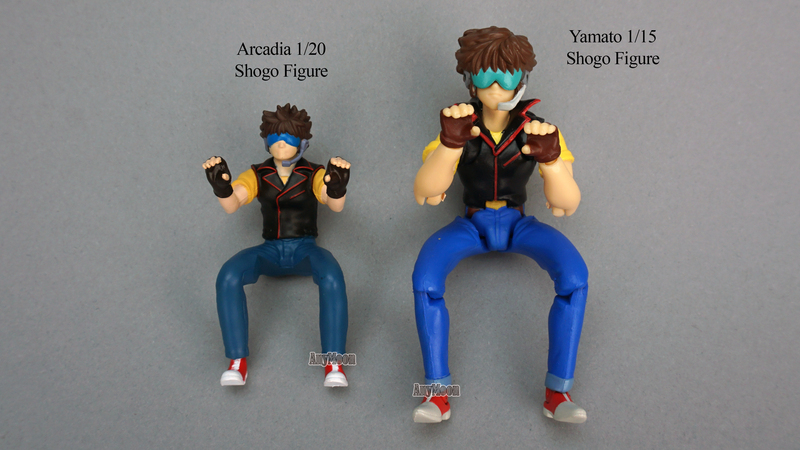 A blue tinted translucent visor on the figure would have been best but instead we get a blue painted one (which is what Yamato did with their larger figure so it’s no surprise). Paint applications are good and, most importantly, the proportions of the body look realistic. This figure isn’t going to make your jaw drop but it’s not going to make you grimace either. 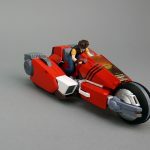 There have now been several Garland toys but none of them seem to capture a craft mode that seems like it could realistically be a motorcycle. 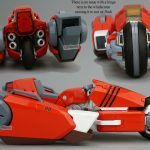 It’s worth noting that a few lines within the context of the show do reference the bike being big but it would still need to function as a motorcycle and most toy renditions of the Garland fail this. Yes, there was obviously some anime magic proportion shifting going on with the original design, primarily with the size of the legs. 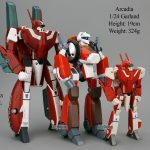 Like previous Garland toys, the legs are too large and too low to imagine banking into a turn. 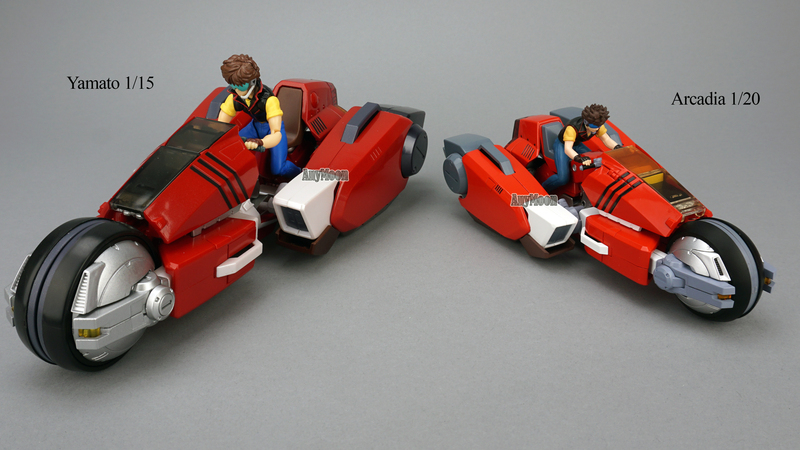 While the Yamato toy had a translucent plastic piece simulating the head lamp under the cowl, the Arcadia toy has a yellow painted rectangle. 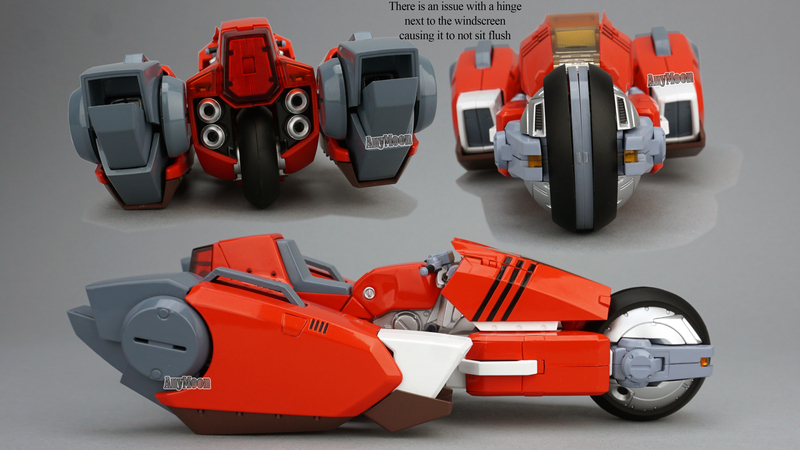 You will find translucent plastic pieces used for the tail lights and turn signals. The instrument cluster is painted and looks sharp. The unpainted gray plastic on the front wheel and various other locations looks very drab in contrast to the shiny paint everywhere else… a slightly darker silver paint than that used elsewhere (or metallic gray) would have worked better but that’s a total nitpick. Slave mode is very nice with large hands and a large head. 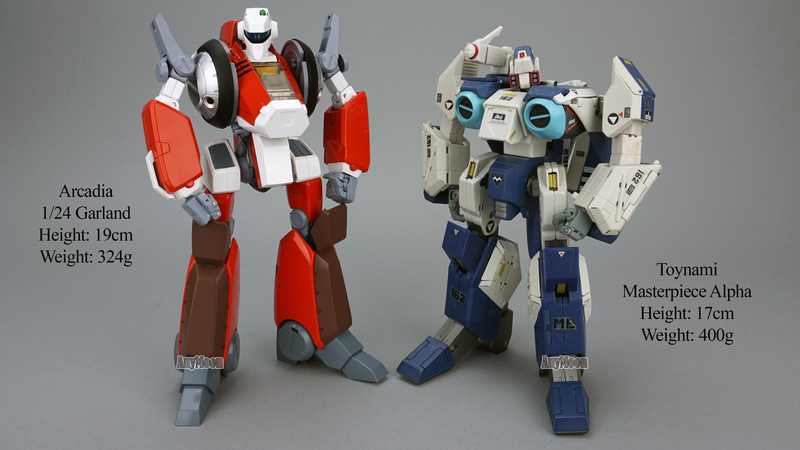 The upper body is slimmer than the Yamato version. 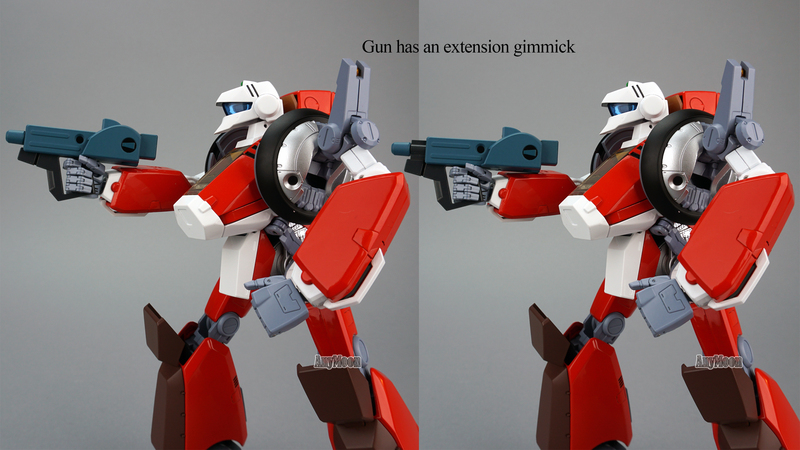 The screws are concealed and the paint job is absolutely top notch. 1) The tires spin (but see first negative as well). 2) The rider torso and head figure from your nightmares can be tucked into the ‘cockpit’ while in slave mode. 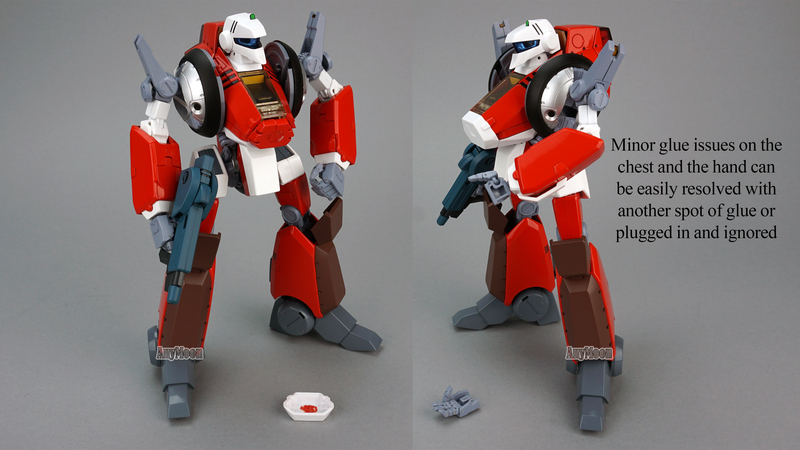 3) Perfect and fluid transformation that is solid in both modes. 1) Surprisingly for a toy with this much metal, the tires aren’t rubber. 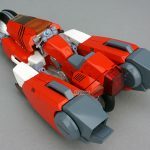 There is a good deal of resistance on how the front wheels spin so largely they don’t spin at all, the toy simply slides on the front wheel which could lead to scuffing. 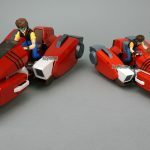 2) While you can put a creepy torso in the figure, the Yamato toy and even the dreadful Freeing E=X Garland allowed full size pilot figures to be placed inside the vehicle in slave mode. What’s odd about this is that the rider figure makes the Garland seem like a huge bike. If they weren’t going to put the pilot inside, they should have provided a larger Shogo. 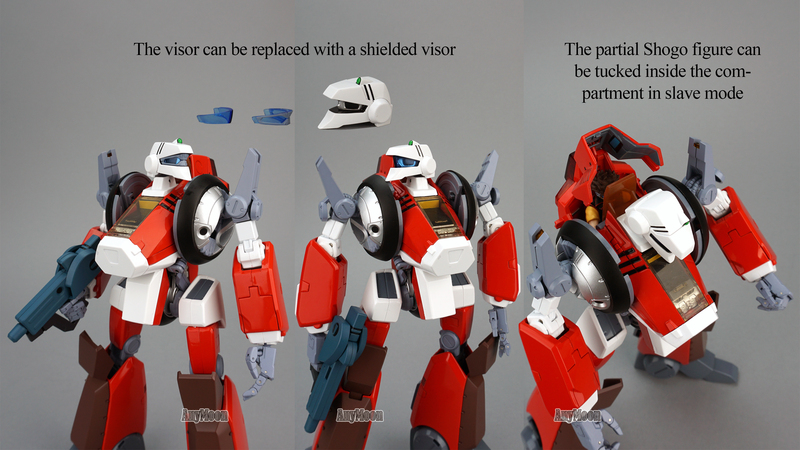 On a neutral note, the toy does have an optional battle visor but you have to pop the head off and use a toothpick to replace it. Once in place it stays on very securely but, in a larger toy, the ideal would be to have something like this be integrated, or more easily employed. This is certainly a good Garland toy but it doesn’t add anything unexpected. 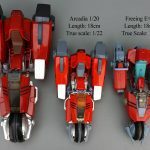 As with all previous Garland toys, there’s no ability to angle the front wheel (which would take quite a bit of engineering) nor is there any mechanism for mounting the gun in craft mode (though I’m not sure Aramaki ever gave much thought to that). The transformation, and how solid the end result is in either mode, is the only thing that will provide a real ‘wow’ factor. 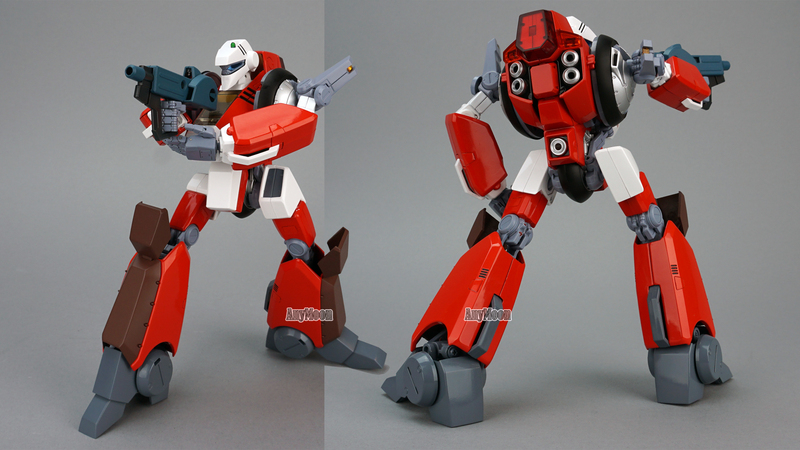 I would have liked if the knee caps had a soft lock in the forward position in slave mode. 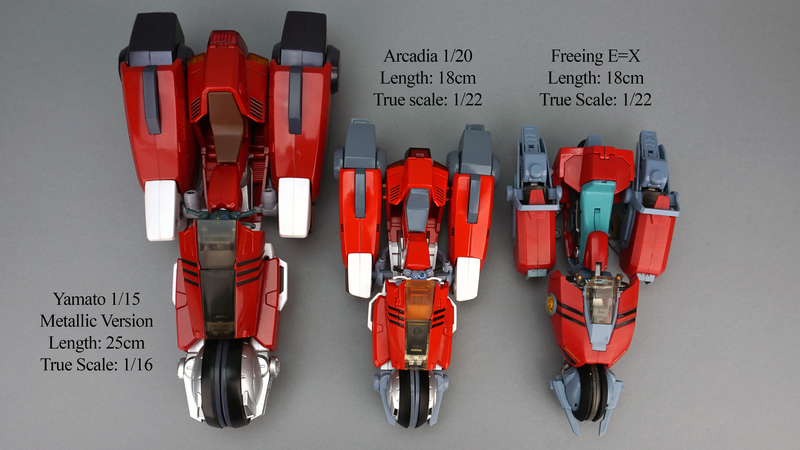 The preponderance of the die-cast metal is located in the legs which is great for durability purposes. 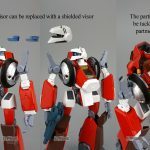 Die-cast in the arms would have made them too heavy for the shoulders to support them and die-cast in the torso may have proven challenging for the hips. Metal content creates color-matching and paint difficulties for manufacturers that need to deal with painted metal, tinted plastic, and painted plastic. Unfortunately, paint scratching will be an issue, see the scan included for particularly troublesome spots and I witnessed first-hand that they truly are trouble spots. 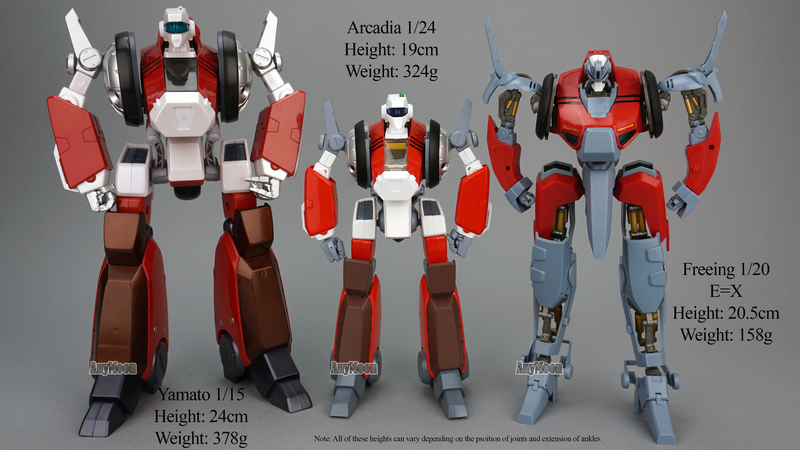 As the flyer indicates, Arcadia decided to paint plastic that was already molded in color to deliver a more luxurious feel so the white hexagon that serves as the front of the chest is painted white over white plastic. Mine had a chip on it straight from the box and others are reporting similar issues after a couple transformations. That same hexagon also is attached to the toy via glue that to the paint beneath so it pops off easily taking the paint with it. A dot of glue should fix that. Another area where the glue didn’t hold on my toy was the back of the hand. Nothing was broken, but the glue was insufficient and I should glue the hand back on but I probably won’t bother. 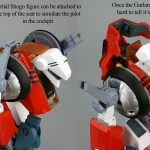 Another area of significant concern after the Yamato 1/15 scaled debacle (see my review of that toy separately) is shoulder durability. 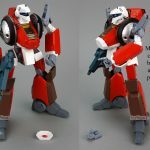 Fortunately, it looks like we’ve avoided the fatal shoulder issues that plagued many red Yamato Garlands but the question of long-term stiffness remains. 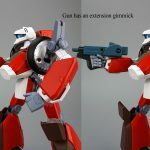 The shoulders are not ratcheted so it seems, particularly for the arm that will hold the gun, that looseness may be inevitable. 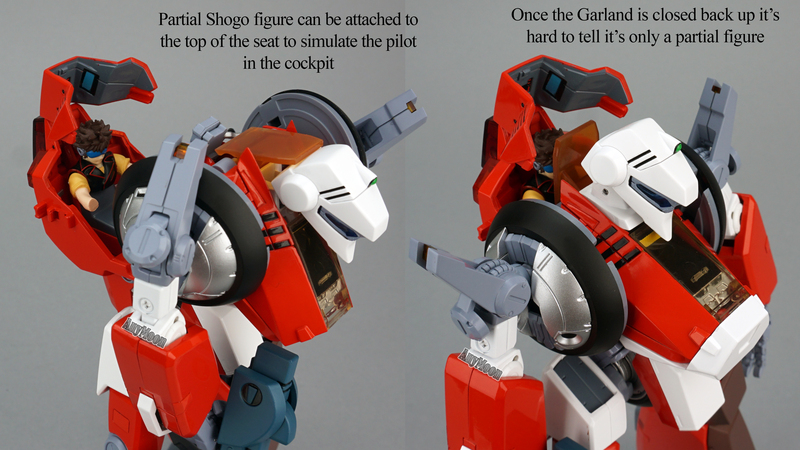 The Shogo figure’s head is pegged on so it has ball joint articulation but it’s limited in range. 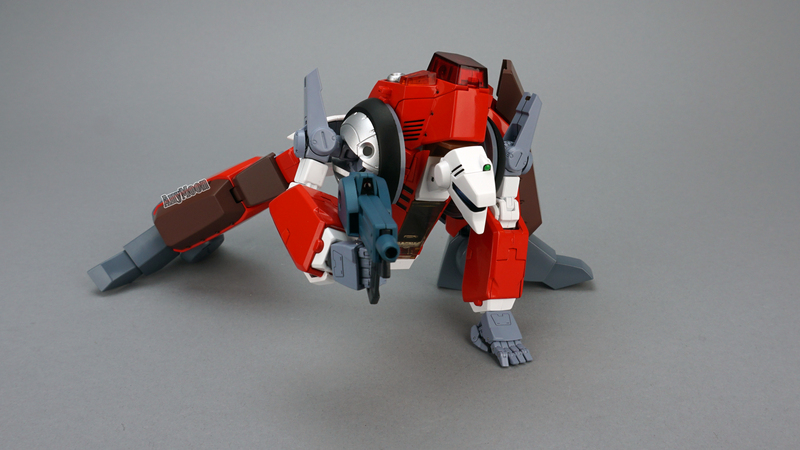 There are no other joints on the small figure. 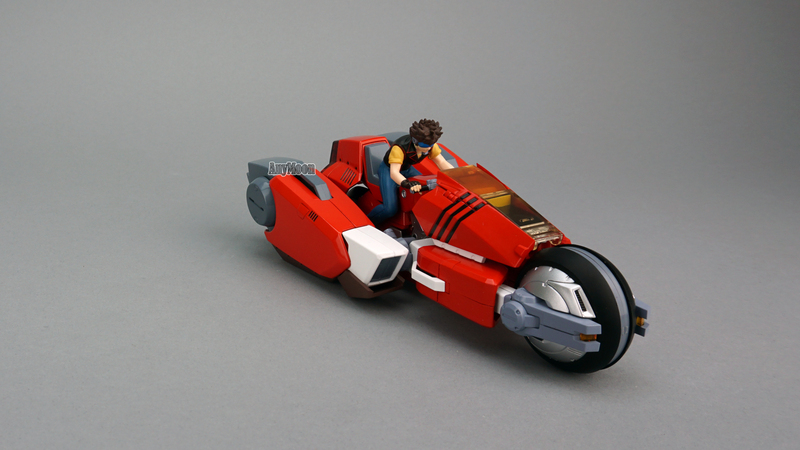 As noted previously, bike/craft mode has spinning wheels but they’re a little stiff. Slave mode is very nice. 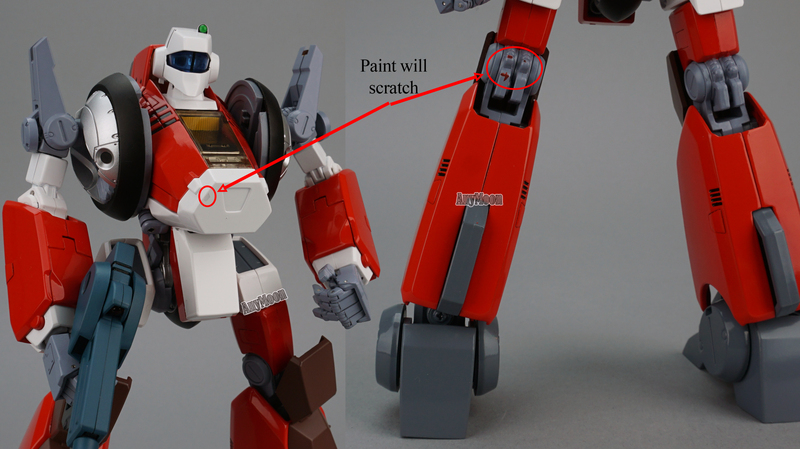 The head is on a ball joint as is the neck which offers an extension for greater range of movement. 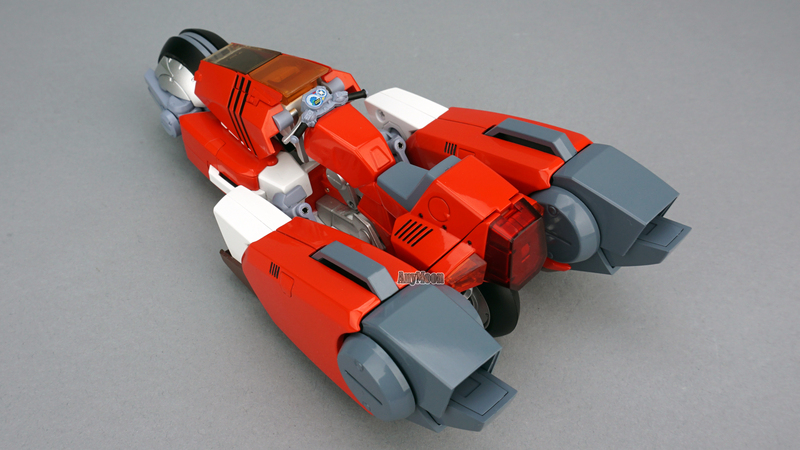 The shoulders are on a wheel that spins around. I’m not sure I like the ability to move the entire shoulder on that wheel, it’s easy to get the shoulders out of alignment with each other and it doesn’t seem particularly natural. 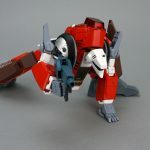 Furthermore, if they could spin forward it would allow you to get more clearance from the large chest for arms forward poses but the wheel only spins about a third of the way around toward the back. 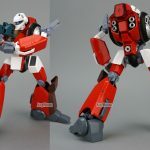 Gone is the Yamato incorporated pivot of the shoulder forward-and-back but the range of motion was very small on the Yamato and probably not worth the complexity in this smaller scale. 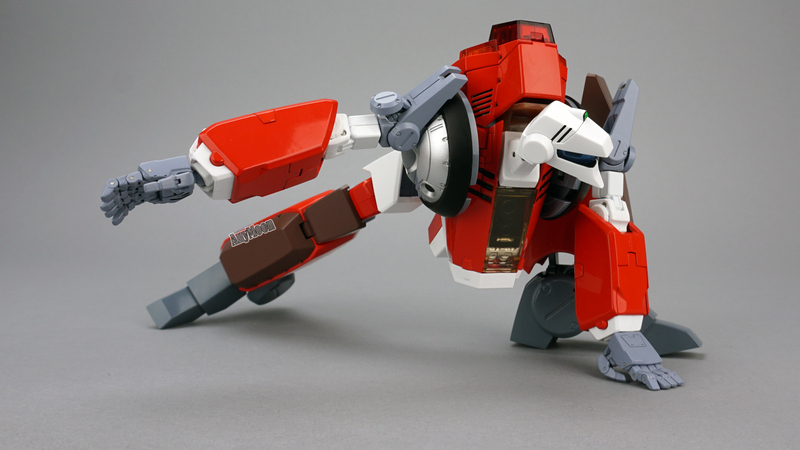 The shoulder prongs move and conceal a pivot beneath them allowing the arm to swing out farther from the body. There is a rotation point at the top of the bicep and a double-jointed elbow that allows something like 135 degrees of movement. 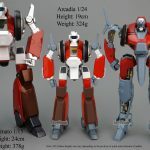 The hands are incredibly well articulated with individual finger joints/knuckles, connect to the body via a ball joint at the wrist, the ball joint connection at the wrist extends forward, and there’s even a little bit of rock at the wrist collar for a bit greater range of wrist movement. 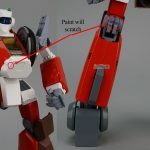 There is no waist but the hips connect as ball joints with a good amount of clearance allowing the top of the leg to tilt in/out, angle the legs close to center or far apart, as well as rotate the leg way back/forward. 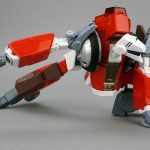 There’s a swivel underneath the hip and then a truly impressive double-knee joint that gives you nearly 180 degrees of movement to the back and even a few degrees forward. As impressive as the knee is, the ankle is a little bit of a letdown. It extends away from the leg allowing an impressive ability to angle it left/right but there’s no ability to swivel the toe in/out. There is a joint allowing the foot to angle up/down at the ankle but mine was so stiff I didn’t know it when I shot the video review. The toe is articulated in two spots and so is the heel, so even with a very stiff up/down joint in the ankle, I was able to have a lot of fun with the feet. This toy feels like a reaction to the Yamato toy in many ways. It’s rock solid and heavy. 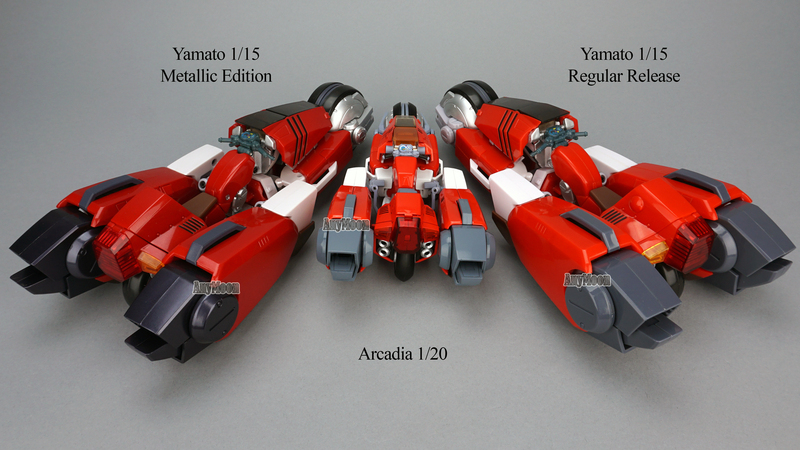 I was a fan of the Yamato toy, and I’m still a fan of its larger size, but this toy feels refined in a way that I don’t experience very often. There is no comparison of this toy to Freeing’s E=X Garland which is, comparatively, an absolute disaster. 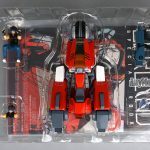 If you’re a fan of Megazone23, transformable motorcycles, or the Garland design, you really ought to grab one of these. 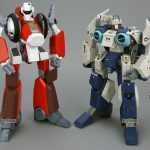 Of course, this is a very expensive toy, so if you’re not a fan as listed above, there are likely many other toys in this price range that you may find offer a more compelling value.